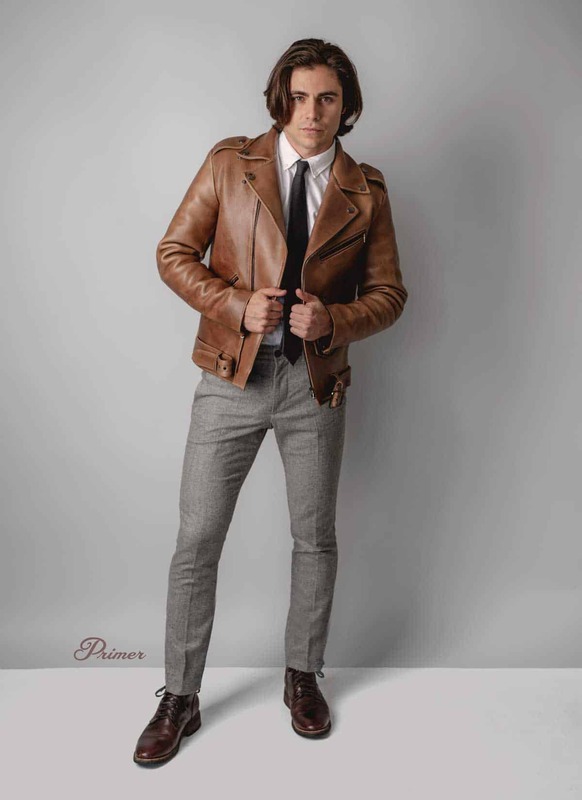 Thanks to Thursday Boot Co. for teaming up with us on this post, check out their new line of beautiful leather jackets. 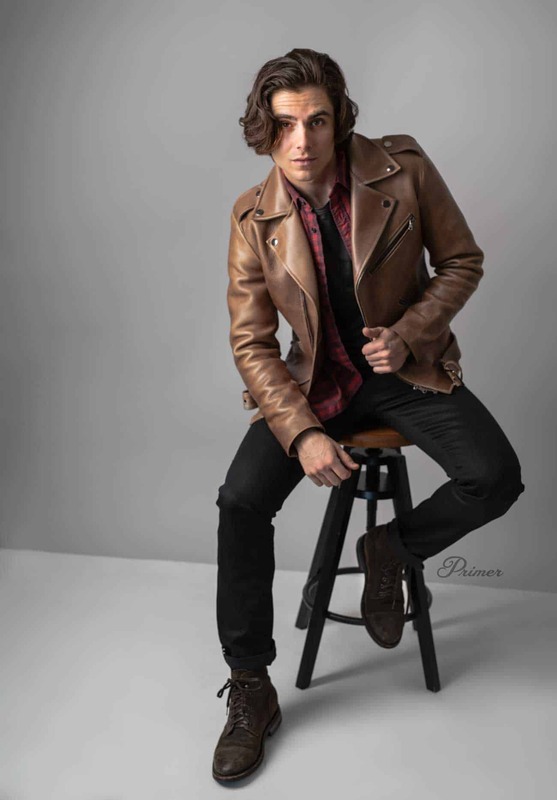 Along with my lifelong appreciation for Swiss Army Knives and my brief stint with a mullet when I was 7 (really), I’ve always had a thing for leather jackets. There’s something primally utilitarian about them. They’re built to be beaten – and when you do they look even better. One of the few things that we buy that receives compliments for how great it looks beat up. I’ve had a long journey with leather jackets. I got my first when I was only in elementary school. I begged and begged, and was finally able to get a MacGyver-esque brown bomber jacket from Hess’s Department Store for $69 with a couple of gift certificates I had accumulated. I bought a suede trucker jacket from Wilsons Leather in college that was on discount but never ended up wearing it because it was a full size too large. In the early days of Primer I picked up another from there, my first moto jacket. It was distressed and decent for the price. A couple of years ago I spent $200 on a vintage leather jacket from a flea market which I thought was a huge score. But I didn’t know anything about vintage leather jackets and when I tried to care for it by moisturizing it, the leather ended up drying and cracking all up and down the left sleeve. I had to spend another $200 to have it fixed. To say I’ve been trying to find the balance of a great leather jacket on a budget for my whole life is not an understatement. But Primer has an informal policy: we don’t post fake leather jackets in our Getups, deal posts, or articles. Why? The trouble with fake leather jackets is they always look…well…fake. Sometimes known as PU Leather (short for polyurethane) or Faux Leather, these options always look and feel like an imitation regardless of how much they cost. With a fake one you're not getting the cool factor of a leather jacket at a discount – you’re overpaying for a plastic jacket. A fake leather jacket doesn’t earn a patina, it wears out and flakes. And they’re not even that cheap; a fake leather jacket can easily be $200! 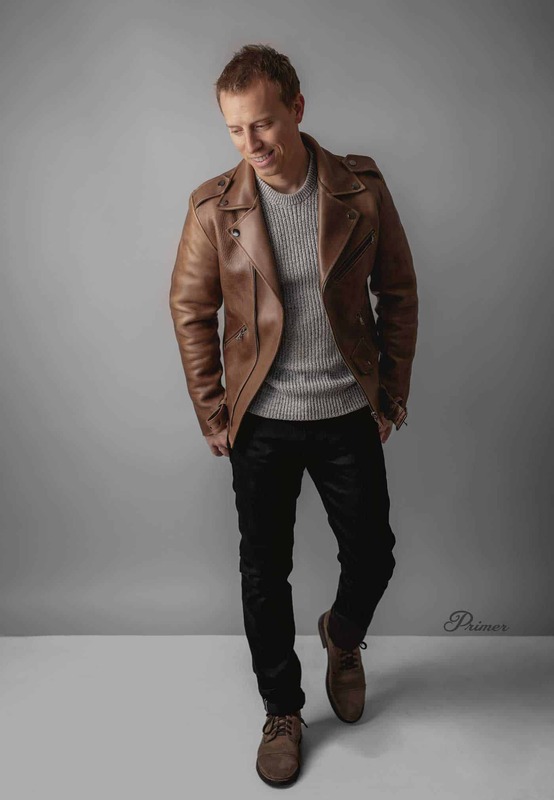 My position has always been if the cost of a real leather jacket is not in your budget, you should opt for a different look – like a denim trucker jacket, field coat, or pea coat instead. However, as I’ve learned through my lifelong journey with trying to buy them on a budget, real leather jackets are expensive. Vintage can cost you thousands or lottery-level flea market luck. Mass market brands can be more affordable, but still easily $500+… and they come with a hidden downside. A mall brand leather jacket may look good in product photos online, but I’ve bought and returned at least 3 in the last 10 years because of how disappointing the quality of leather was in person. In short, there hasn’t been a go-to option for guys looking for a lifetime-quality, real leather jacket at a reasonable price point. That is, until now. One of our favorite leather boot makers, Thursday Boot Company, have just announced they’re getting into the jacket business. This is good news. We got our hands on the Thursday Motorcycle jacket made from impressive, Chicago-based Horween Chromexcel leather, and styled it 7 different ways to prove just how versatile and utilitarian they are. We reached out to co-founder Nolan Walsh to get the scoop on the leather and production – and why a boot company is branching out into leather outerwear. The origin story of the Thursday leather jacket begins a lot like the origin story of the Thursday boot: with dissatisfaction. 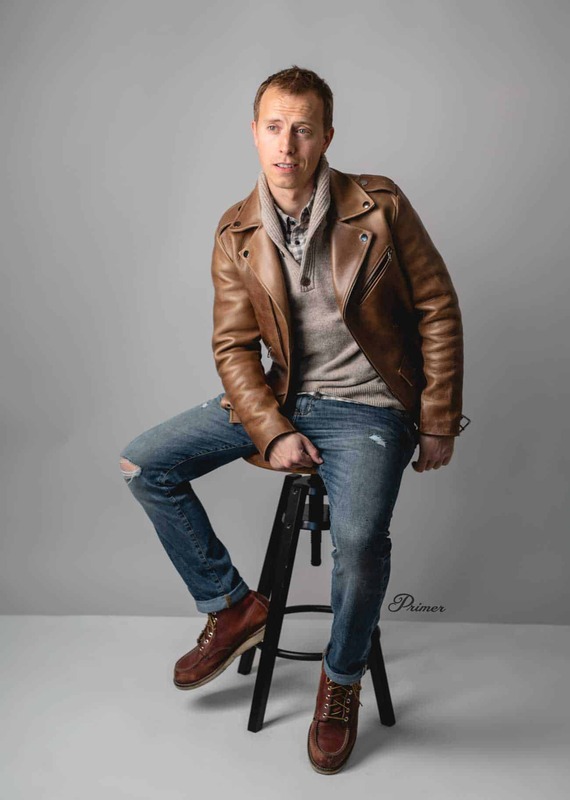 Co-founder Nolan Walsh kept finding himself in conversations with friends that would go something like this: We like leather jackets. We want leather jackets. But we’re unhappy with what’s out there. Walsh resisted the idea of starting a new line. After all, Thursday is still focused on improving their bread and butter – or leather and laces? – boots. But if you think about it, the premium leather boot segment and the leather jacket segment are similar. In both, you pay a hefty premium for (admittedly excellent) heritage or designer brands. Both are leather. Both must be handmade. And just like with their boots, Thursday has a playbook for disrupting leather jackets. When Thursday decided to make a premium boot they did something surprisingly logical: found the factories where leading heritage brands are made and engaged their skilled craftsmen to make the Thursday design with the same Goodyear welts, quality leather, and hand stitching as the competition. Why would they do leather jackets any different? Nowhere is this more evident than the Thursday Varsity Jacket. The manufacturing partner in San Francisco is none other than Golden Bear, a legendary shop that’s been making leather jackets – and leather-and-wool varsity jackets – continuously since 1922. Examine a Thursday Varsity Jacket under the microscope and you’ll find the same attention to detail – cream bovine leather sleeves, leather lined pockets, and Melton wool body – as you find in jackets twice as costly. The all-leather jackets are made in León, but not at the same factory as their boots, for an interesting reason: “Very few of the best factories in a given category make more than one type of product,” says Walsh. 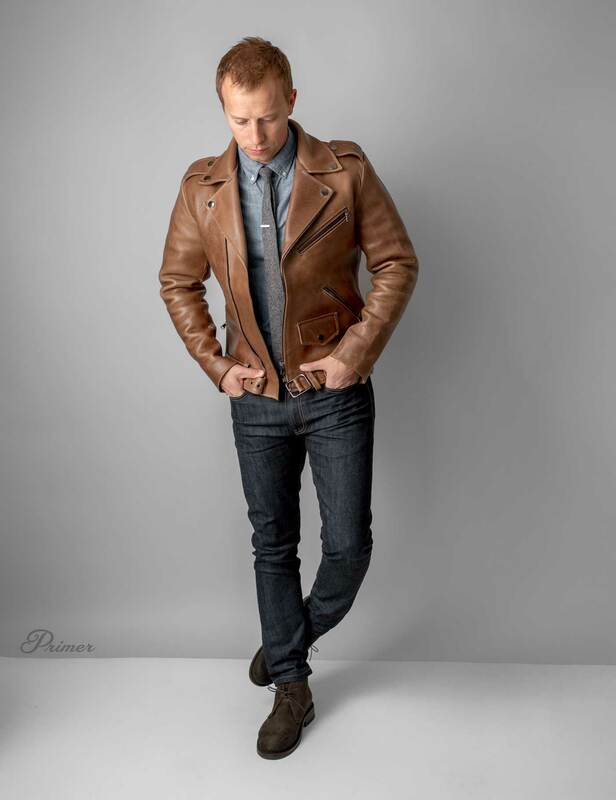 The brown Motorcycle jacket is constructed out of Horween’s famed natural Chromexcel leather, which is top of the line. You can smell it from across the room. If the wonderful leather scent doesn’t get you, the weight will. Weighing in at seven pounds, the Thursday Motorcycle jacket is built like a tank without being unwearable. Like a great pair of boots or denim, a nice leather jacket will break in to your body providing perfect fit and comfort. That thickness means the Thursday jacket doesn’t come pre-distressed. “Chromexcel isn't ideal for everyone (read: most normal people who aren't leather geeks!) because it is quite stiff at first and there is a heavy pull-up,” says Walsh. This is a jacket you will have to break in over time. In other words, you have to earn it. And the reward will be all the sweeter for your efforts. If brown isn’t your color, the black Motorcycle jacket is full-grain leather sourced exclusively from Tier 1 midwestern USA cattle. A real leather jacket is an investment, to be sure. Knowing you’re getting a premium quality piece at half the cost of a more established brand can take the sting out. As with any investment piece, do your homework. Take a quick research pass at the mall: brands like Wilsons, whose jackets I would consider baseline for a leather jacket, come in more expensive than Thursday. Look at the premium brands like Schott or AllSaints, then take another look at Thursday. 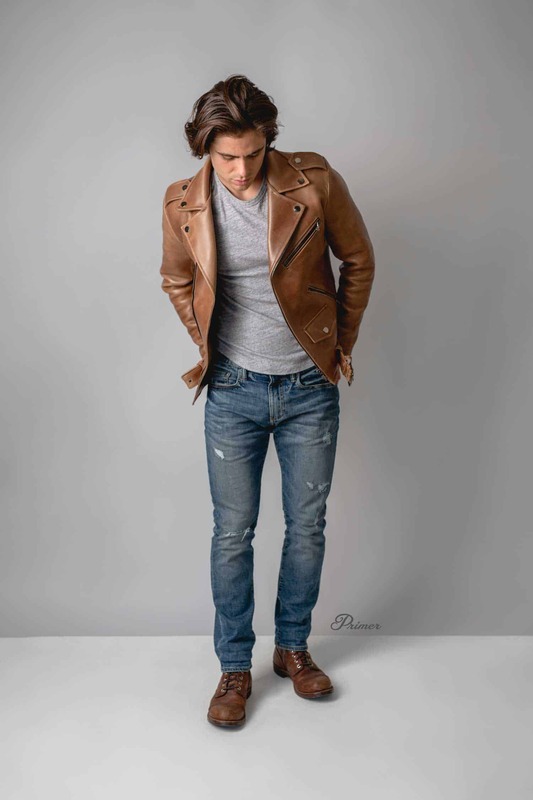 The combination of quality raw materials, craftsmanship, and Thursday’s well-deserved reputation as a bootmaker makes their line of jackets highly competitive. Which of the Getups were your favorites? Chat with me in the comments! Great post Andrew. I bought the same Black Rivet moto jacket you recommended from Wilson’s Leather years ago now, and it’s still in regular service, and looking better every year. These look pretty appealing too. I especially like the flight jacket offering from Thursday. same here. my favorite piece by far. Dang! Nice! What did you like about it? The 6th jacket with the shaker stitch jumper is defiantly my favourite. After spending quite a bit on All Saints leather jackets, i’d like a brand that could stand up to some of the harsher U.K conditions. The Thursday jacket looks like a steal for the price, and the brown colour is something you don’t see everyday. Thank you! So you’ve found the AllSaints jacket to not be as durable as you’d wanted? Can’t speak for zac, but I have one All Saints leather jacket that i bought 2nd hand on ebay and the leather quality is junky. I do get compliments on it though so it’s not a total loss. Curious to check out a Thursday jacket. I have a Schott that is great quality but poorly fitting, schott doesn’t design for athletic slim guys, so still hunting for a jacket that combines style, fit, and quality. How funny, both of mine I’ve bought on EBay. Which style did you go for? I’ve got the Taro and Muir myself. Both biker jackets. As for the leather quality I’ve gone for two that are lamb leather, and seem to get a few compliments on them myself. It’s a field style, with flap chest pockets and slant waist pockets. The leather just seemed cheap to me, particularly compared to my Schott or the vintage Brooks cafe racer i used to own. But yeah, definitely stylish, so not terrible at 2nd hand price. I don’t think I’d drop $500+ for a leather jacket made in India or China. It’s just as I spent so much in it I’d rather not wear it in the rain. What I like about the Thursday option is the good quality, but at a price I wouldn’t mind getting it roughed up. Love all these looks, but being in Kuwait I’ll have to wait until I’m back stateside to try them out. Way too warm for leather here. Nice jackets! Funny enough, I have an atrocious thrifted Sears pleather jacket I’d estimate to be from the mid 1970s. Add a floral shirt, shades, hair gel, and cheap blood and scar effects – Boom! I’m Tyler Durden for Halloween. I also have a serviceable Eddie Bauer jacket – also thrifted. But if and when I decide to upgrade in the leather jacket department, I know where to turn. I also expect to snag black Thursday boots when my Florsheims reach their last legs. What size jackets are you guys wearing? Trying to figure out if M or L is better. I’m 6 foot, 180. Hey Chris, based on height and weight I would guess a medium, I personally would err on the side of sizing down so you get a nice fit. So, I have a similar jacket made by Lucky brand that is the same color. I love it, but it was a gift and therefore slightly too big… Am I sunk with this jacket or is it possible to have them tailored at all? It’s an amazing quality jacket that I’d love to keep and feel more confident wearing. Yes they can definitely be tailored, however you’ll need a tailor with a heavy duty machine. If a yelp search doesn’t return anything call around to couple tailors to see if they can handle the thickness of the leather.